With statistics showing that LGBT Seniors are five times less likely to ask for help, according to Cathy Croghan, a geriatric consultant and public health nurse, we need to think of our LGBT seniors a little differently. New York City is also seeing LGBT welcoming centers, including AHS Caring Communities with its 2 locations in the Bronx and Queens. 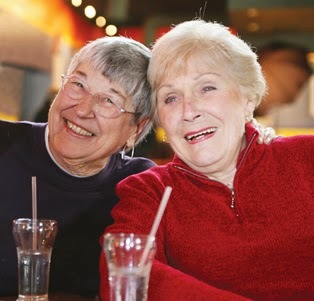 AHS Home Care and Adult Day Programs includes staff that is specially trained to deal with LGBT seniors. A trend that is growing quickly with the help of Training to Serve whose mission is to provide education, tools and resources to improve the quality of life of LGBT people as they age. Croghan, a board member with North St. Paul-based Training to Serve, says “They have these early life experiences that train them, 'Don't tell anyone’”, noting some have lost jobs, children, been ousted by families and even may have suffered electroshock therapy for their sexuality. The hesitancy that many older members of the LGBT community have toward asking for help is especially problematic, she continues, because they are half as likely as the general population of elderly to have children they can rely on for care. They're also twice as likely to live alone as other seniors. "That's kind of an equation for someone who is more likely to need services," Croghan said. 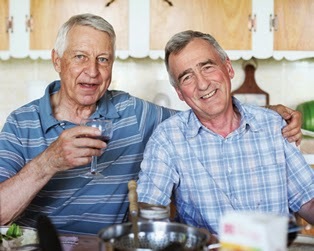 In New York City, upon the opening of the first full-service center for LGBT seniors in the US by SAGE, city officials acknowledged that LGBT members sometimes feel isolated from other seniors. With the SAGE Center opening, LGBT seniors in New York City had help with everything from health and wellness to meals and technology. Luckily the awereness for LGBT seniors is growing. SAGE, (Services & Advocacy for Gay, Lesbian, Bisexual & Transgender Elders) has extended to SAGEnet that comprises 26 affiliates located in 19 states around the country, across every region of the country. These affiliates provide services and programs to LGBT older people in their local communities. They also work on city and state advocacy to ensure that public policies better support the needs of LGBT elders. So hopefully with these programs and groups in place, LGBT elders are on their way to the same golden years as their heterosexual counterparts. Call them at 718-441-6802 to schedule a tour.